Consider this plug to be a “thank you” for what comes next. One of the things that David does for followers of his blog is that he creates a monthly desktop wallpaper calendar. He has even provided the Photoshop template he uses to anyone who wants to make their own. So in keeping with the tradition of sharing I have decided to offer my own monthly calendar wallpaper. Free of charge, just for fun, hope you like it and tell others! I’m going to try to avoid duplicating the image used in my print calendar, just for a little variety because I’d hate to limit myself to only 12 images per year! I’m going to try and pull images from the more “artsy” side of my portfolio for something a little different. 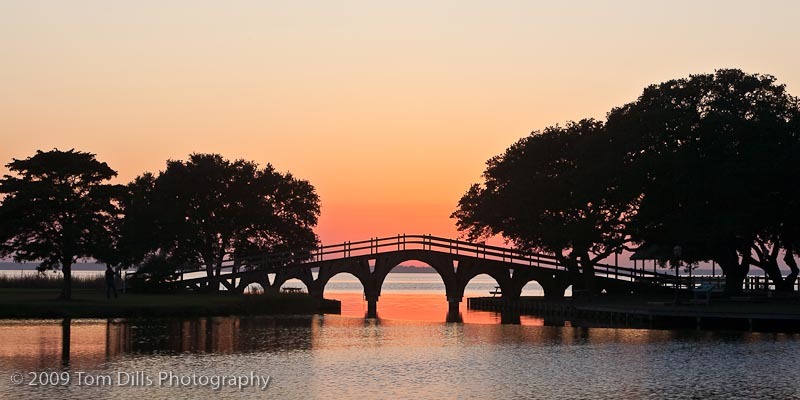 This month’s wallpaper is a photograph I made a few weeks ago in Belhaven, North Carolina. 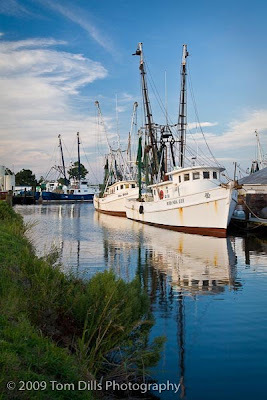 Belhaven is a wonderful little town on the Pungo River. 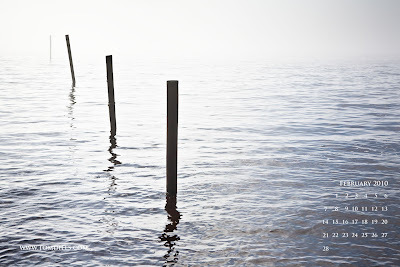 A quick temperature change created a layer of fog over the water and I was able to capture some images that represented the dissolving effect of the fog on this receding line of pilings in the water. A little over a week ago my recent period of unemployment ended. I’m back to work, in banking where I have been for 30+ years, doing work I enjoy for people I respect and for which I am well paid. With that change comes the end of a period of time where I had the luxury of being able to work on my photography full time, while looking for work and “getting paid” by collecting unemployment compensation. It was not a bad gig, but it was never permanent. I knew that, and although I hoped and to some extent still wish it could have been different I knew it would eventually be time to go back to reality. As it turns out reality isn’t all that bad. Photography had been my Plan B for a number of years. I had regarded it as something to do if my employment situation changed involuntarily, or as something to pursue full time once I hit the lottery or was able to retire of my own volition. I knew from day one of my unemployment that no matter how much I wished it was otherwise my ultimate destiny was to get back into banking as soon as the right opportunity came along. While I’m sure that I eventually could have made a steady income from photography it is unrealistic to expect that I would ever earn the kind of income I had – and now have again – in banking. 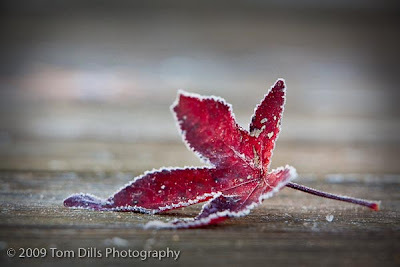 No matter what my heart told me about how much I wanted to do photography full time and all the rationalization about whether it was “meant to be” I remained focused on what had been my goal from the time I started working full time and saving for retirement: to be able to retire on my terms. It’s not time yet! 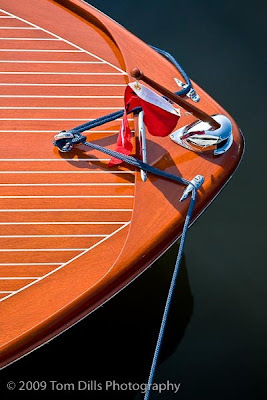 The great thing about the period I had off was that I was able to devote almost 100% of my time and effort into the numerous projects and tasks that I had been trying to cram into a part-time hobby that had been busting at the seams. Processing old files, organizing and keywording images, preparing images for submission to a stock agency, submitting images to galleries for sale as prints, filing copyright registrations – the list goes on. Looking back I accomplished a lot. I assisted Nanine Hartzenbusch at The Light Factory’s Shootout, sold a number of prints, donated a print that sold for an exorbitant price at The Light Factory’s Auction, became an assistant for Kevin Adams on his return to the photo tour business, taught a couple of Lightroom classes, did some one-on-one Lightroom tutoring and am on the schedule to teach some classes at The Light Factory this winter. Wow! That’s stuff that it might have taken me 5 years of part time effort to achieve, and I did it in nine months! Now I get to look forward, and I am doing it optimistically. One of my friends remarked that now I will be able to afford some new gear. That may be true. Ironic isn’t it that we need to have a job doing something other than photography to afford “professional” photography equipment? The great thing is that everything I have accomplished is something I wanted to accomplish, and while I have made a little money from it they are things I wanted to do anyway. Going forward, I only have to do the things that make me happy. If I want to shoot I wedding I can, but if I choose not to I won’t have to worry about paying the mortgage. If I sell a print I’ll use the money to buy more ink and paper. Next time I teach a class for the CNPA I can let them keep all the money instead of keeping a bit for me. The best thing is that going back to being a part-time photographer doesn’t make me any less a photographer. It will allow me to be an even better photographer because I do best those things that make me happiest, and I’ll do them better without the pressure of having to make money from them. Who knows, I may decide to sell my prints for $20 each. Some people may scoff, but if I derive the most pleasure from sharing my work and if selling prints for $20 means I can share my work with more people and that more people can enjoy it, so what? I won’t of course, but I could. I just bought a new printer, the Canon iPF5100. It’s a fine printer that is capable of making real good prints. My goal this year is to master it and to master fine art printing. Not to become the next John Paul Caponigro, but to become good enough that I can print my own work and be proud of the results. Now I’ll be able to do it for me, and I can do it with the confidence that I’m doing something I want to do because I want to do it. I can take as much time as I need to get it right and know that once I am happy with the results that’s as far as it needs to go. If other people are happy enough to buy some prints that will be a bonus, but it doesn’t have to be a goal. While I work on my printing I am going to be less focused on taking new pictures. I don’t feel like I need to be running all over the countryside chasing flowers and bugs and sunsets and water just to take more pictures. I’ve got plenty now and I know I’ll take a lot of new ones this year, but if I never take a new one I have enough to work on that it will take me years to go through them! The great thing is that as I continue to develop my vision my photography will improve, and as I learn more about printing I’ll learn to take pictures in a way that I will be able to make better prints. It’s all part of the process. It sounds like a lot of fun, and I’m looking forward to it. It’s a new adventure! 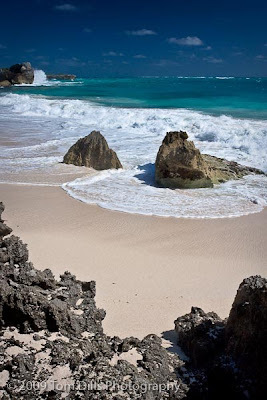 Photo is from our recent trip to Barbados, at a beach called Beachy Head. I’m going back there. Soon! In the last couple of days I have been preparing to pack for our upcoming cruise, an annual tradition for the last 9 years. In recent years I have managed to convince myself that I was on vacation and took only a point & shoot camera – albeit a good camera – the Canon G9. With the exception of our first couple of cruises when I was still shooting 35mm film, and our one trip to Alaska where I had just purchased my Canon 20D, all I have ever taken on a cruise was a point & shoot camera. A couple of months ago I decided, with Kathy’s blessing since it does effect her, that I wanted to do some more “serious” photography on this cruise. We’re going to visit several islands that we especially like, consider particularly photogenic and have only been to a few times. Given my current lack of gainful employment it is uncertain when we will be able to justify another cruise, so I wanted to get some “good” photos from this trip. Herein lies the dilemma: how much gear is enough? In keeping with the theme of my last post, once you decide to do “serious photography” there is a certain minimum level of equipment you are committed to. I want to make sure I have enough equipment to do what I want to do, without taking so much gear that it becomes a burden. I started by deciding which camera bag I wanted to take, figuring that the size of the bag would determine the amount of stuff I would take. Something more than a point & shoot but less than my entire large 40-pound airline-legal rolling bag, preferably. My rolling bag would be a good solution for getting stuff there, since it is easy to handle and designed for travel. But it holds literally everything I use, and that seems a bit excessive. I’d still have to take my backpack, which would need to be packed separately, because I would want that for carrying my gear with me on the islands. My backpack seemed to make the most sense, since it was the bag I took to Alaska with me, holds as much as I can reasonably carry but is not too much to handle. This is traveling light? From all this it doesn’t look like I’m leaving much behind, but there is still a lot of stuff left in my regular bag! Most amazingly, what would I leave behind? It all fits in my backpack, so if I take anything out I will have empty space. Can’t have that! Besides, other than the 70-200 there isn’t any single thing or combination of things that would make enough of a difference to matter, and I’m not leaving the 70-200 at home. No way! I’ll use it all, and there will be something I don’t take that I’ll wish I had, like my 2X extender, extension tubes or closeup lens. But I think I’ve covered 99.5% of the situations I’m likely to encounter, and that’s about as close as I can hope to get. Besides, I’m going to be doing a lot more than taking pictures! It’s amazing to me how much stuff I feel like I need to take just to take “serious” pictures. But given that I want to be sure and cover as many bases as possible, I just can’t imagine getting by with anything less. Let’s hope the results are worth the effort! I don’t generally spend a lot of time on message boards, although I will admit to doing my share of posting. I recently contributed to a discussion on the CNPA forum about printers and printing. I made what I thought were some reasonable and well-explained opinions on the type of printer one might look for when getting started printing, the many types of papers involved and the importance of having a properly-profiled monitor so you would have some assurance that the colors on your screen would be well-represented on paper. First of all, CNPA is an organization of what, 2000 members now? And this particular person is one of the nicest, most social and outgoing people I know. She surely could have asked for and received help from someone in this organization! One of the dozens of people she regularly shoots with would have had exactly the knowledge she was looking for. Secondly, how much does a colorimeter cost? In the context of the money we spend on camera, lenses, tripods, computers, printers and accessories, why would one not properly calibrate their equipment to get the best possible results? That got me thinking about all the little odds and ends that we often don’t factor in when we sit down and calculate how much it costs to do what we do. Photography is expensive. Whether we do it as a hobby or as a profession, it costs a lot of money. And that’s not just the gear. The travel is expensive, too. We do it either because we love it, because we’re trying to make a living from it, or both. There aren’t many inexpensive hobbies, at least not hobbies that I know of. Does a golfer spend several thousand dollars on clubs then shoot with “x-out” golf balls? I grew up in a town with the only (at that time, at least) free public golf course. I played with second-hand clubs and balls I had found. But you don’t become Tiger Woods playing that way. Would a musician buy an expensive guitar then listen to himself play through earbuds? I don’t think so. It is possible to do photography well with used equipment (it’s all used, right? ), old computers and even old printers. But for most of us that is an exception. There is a certain level we want to be at in order to enjoy what we do, produce results we can be proud of and go to the places we want to go. There is a certain pride and satisfaction that comes from pulling out a new lens or some gee-whiz accessory and using it. There is nothing like visiting a fantastic location for the first, or second or twentieth time and taking nice photographs. But then what? We want to share them, either by posting them online, selling them to publications or making prints. That’s all part of the fun, but it’s also part of the cost. There was recently another thread on the CNPA forum where someone shared a checklist he had made to keep track of the gear for certain kinds of trips. That was great stuff and very helpful. I have my own checklist of things to take on various types of trips, from weekend get-aways to cruises. It’s a great way to be organized. How about a list of all the things we need to be photographers? How many people, if confronted with such a list, would decide to take up another hobby because of the expense? I’ll bet a number of people would, especially once they realized the cost! Since we don’t have that list, at least not that I’m aware of, we sort of accumulate things as we go. We buy a camera and lens, then a polarizer. Maybe a nice bag. Then another lens, or a tripod. Then a bigger bag. We buy a computer but need a bigger hard drive, or some kind of software. I once heard Tony Sweet tell a group that “digital photography is really not that expensive. After the first $20,000.” For many of us that’s not too far off! Everyone has to decide their own level of comfort based on their own personal situation. That can be determined by time, budget or other factors. But there are some things that no one should do without. One of those things is a properly profiled monitor, and it doesn’t matter which colorimeter you use as much as is does that you use one. There are many more things that are equally important or more so, but you don’t always have to buy the fanciest or most expensive version. You need to get the best one you can afford that does the job. Does everyone need a $1200 tripod or a $200 polarizer? Of course not. A good sturdy tripod is not cheap. My polarizers, and I have several of them, cost more than many of the cameras I see tourists carrying. In fact, that is often the response when someone asks me how much my camera cost. I’ve always been a believer that whatever is doing is worth doing well. That’s why I gave up golf a long time ago. I was horrible at it and no matter how hard I tried I could never figure it out. I’ve had somewhat better luck with photography, but it is not any cheaper! I’m also a strong believer in ‘to each his own’ but my personal opinion is that being the best photographer I can be means being able to own good equipment (not necessarily the newest or most expensive) that gives me good results, learning to process my own photos and competently print my own work. That carries a certain level of financial commitment. Not everyone shares my goals. For many people sharing photos on Flickr or Facebook is their aim. That’s great, but even then there’s still a minimum cost to play. Maybe not as much as some, but it’s there. Camera gear is great and I always want more, but to me, the ability to experiment with paper and processes and tweaking my photos to get them where I want them is part of the learning process. I consider a good printer to be an essential part of my photography equipment, and it is as important to me (or more so) than another lens or camera body. And that takes a certain level of commitment as well. To wrap up, my point is that there are some things you just need to have in order to do any hobby. Some of them are expensive, some not. It’s sometimes hard to come up with another $75 or $100 or $500 when there are lots of other things competing for our funds, but some things are necessary, and some are just worth it. When it comes to printing, whether you print your own work or send it to an outside lab, you need to be sure that the file you are sending is accurate, and that takes “just another piece of equipment.” There are a lot of those, and as hard as it is, sometimes you just need to do what it takes. 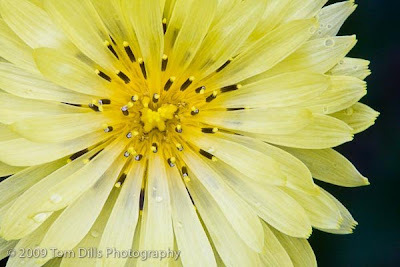 My 2010 Photography calendars are now available for purchase! 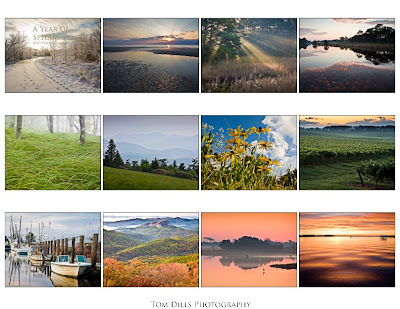 This year’s theme is “A Year of Special Places” and consists of 12 images from beautiful locations throughout North Carolina, South Carolina and Virginia. The calendars are printed by Mpix, the same company I have used in the past. The size is 11×17″ opened. A preview is available on my website, my blog and on Facebook. The cost remains $20, plus tax and shipping. Calendars will be printed and mailed the first week of November, so there is plenty of time to get yours. And they make great gifts! To order more than one, e-mail me directly and I will send you a Paypal invoice for the correct number and amount. To make your purchase easy, quick and secure, click on the “Buy Now” button and you will be taken to a secure Paypal page where you can complete your transaction. A Paypal account is not necessary, and you can pay with a credit card or electronic check. This afternoon Kathy & I visited The Light Factory in Charlotte to view their current exhibition entitled Group f64 and the Modernist Vision, which includes original prints from Edward Weston, Imogen Cunningham, Willard Van Dyke, Brett Weston and Ansel Adams. I’ve seen some of these prints before, but never tire of seeing them again and again. One of the things that The Light Factory is doing with this exhibit is offering personalized tours of the exhibit with Chief Curator Dennis Kiel. I organized a group tour with Dennis and offered it up to our nature photography group, figuring that an opportunity to learn something about the history of photography – particularly of this era of photography that has been so influential – with someone so knowledgeable as Dennis Kiel would be an opportunity no one would want to miss. Suffice it to say that I grossly overestimated the level of interest. After some cajoling and persuasion I did manage to attract 9 people, including myself, and I think those who attended are nearly as serious about their photography as I am and enjoyed the tour very much. I’m continually amazed that for all people like to talk about their photography, and how serious people say they are about photography, that there is a general lack of interest in seeing work that is so important to the history of photography. This may sound silly to some, but just standing in front of some of this work brought tears to my eyes, it is so beautiful. No matter how many reproductions you have seen and how good they might have been, there is no substitute to seeing work of the masters in person. And to have the tour narrated by an expert in the field really appealed to me. Most of the others in our group seemed to think so as well, although after an hour and a half most people had reached the limits of their ADD. I could have stayed another couple of hours! As I have written here previously I am currently on a personal mission to learn more and more about the history of photography, and am simultaneously trying to develop my printing skills. I have a long way to go on both, but seeing work like this is so inspirational and motivating that I want to do more and more. I’ll never be an Edward Weston or Ansel Adams, but learning what really good prints look like and experiencing them firsthand gives me a much stronger foundation upon which to base my own work. All of a sudden I see things in my own prints that I want to go back and re-do. It certainly gives me something more to work with on future work. I can’t get enough of this stuff! 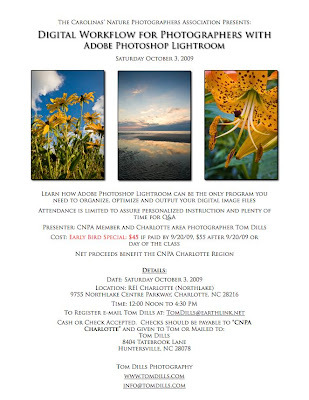 I am teaching a Lightroom workshop this coming Saturday, October 3 at the Charlotte REI store. The class will begin at noon and end approximately 4:30PM. I will be covering all aspects of Lightroom, from basics to more advance topics. I am a photographer. I used to be a banker, a pretty good one too, until I fell victim to our planet’s financial collapse and was forced into a premature and hopefully temporary retirement. I’m probably a pretty good photographer too, but the measurement of ‘good’ is hard to define in either world. I made good money as a banker. I make no money as a photographer. I loved banking. I love making photographs. During my recent hiatus from banking, it might have been easy to sit around and complain about all the things I’ve lost, the real retirement that was almost within my grasp, the financial goals that are now a few years farther away. Instead, I’ve turned my energies to filling my time with learning, educating myself about the history of art and photography, developing new skills and methods for making photographs. I’m as happy now as I have ever been, so even though I am not seeing a success than can be measured in dollars, I am the wealthiest now that I could ever have imagined. I’m glad I started into photography when I did, as although I have the time today it would be difficult to justify the cost of the equipment I own, even though by some standards it is obsolete. I am thankful that I have had something so stimulating and rewarding to keep me from going stir-crazy. The toughest thing about the last few months is not knowing. I’ve sent out dozens of resumes, and have even had quite a few interviews. They’ve all went well, but there are so many people looking for work that the competition is fierce, and there are lots of people looking for work with the exact skillset that hiring managers are looking for. And while having 30+ years makes me valuable, it also makes me – at least in the eyes of hiring managers – expensive. Never mind that my current income is now zero! I’m really a heck of a deal to someone looking for someone who knows banking, but no luck so far. A couple of weeks ago Kathy & I spent a weekend with Andy & Karen Fisher, who own a B&B in Belhaven, North Carolina. We’ve gotten to be friends with Andy & Karen over the course of several visits, and we have had the opportunity to go with them on their boat and have had dinner with them and some of their friends. This last visit Andy introduced me a couple of times as “Tom is a professional photographer.” The first time I thought, “well, not exactly.” But after the second time I though “dammit, he’s right, I am a professional photographer.” That made a real impact on me, and for the first time made me start thinking of myself as a photographer instead of a banker. Now I just need to figure out how to expand on that and make something of myself. Image is from Far Creek in Engelhard, North Carolina. I’ve been playing around with online print-on-demand services in anticipation of publishing my 2010 calendar. Since I no longer have arm-twisting access to a large portion of my customer base (co-workers from whom I purchased Boy Scout popcorn and Girl Scout cookies) I want to go with a company that has the ability to do online sales. So far the front runner has to be Lulu, partly because I have experience using them from when I published my SoFoBoMo book, and mostly because their price and quality seem to be a good balance. 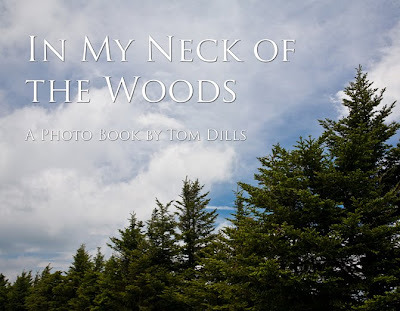 I was playing around with their site today and was interested in the idea of publishing eBooks. I’m currently working on updating a digital workflow presentation and am im the process of writing a tutorial on registering copyrights, both of which I would like to publish as eBooks. To see how the process works I decided to turn my SoFoBoMo book into an eBook, which I then published and am offering for sale at $10. Not a bad deal if you ask me, except for the fact that it is available for free at the SoFoBoMo website. I’d be interested in feedback from anyone who gives it a try. Calendars will be ready for purchase (hopefully) around October 1. I spent some time this past Friday morning shooting on the Torrence Creek Greenway with CNPA member and photography buddy Don Brown. The ever-changing palette of wildflowers on the greenway never ceases to amaze me. Every week throughout the year brings something new, while some old friends say good-bye for the season. Just lately we’ve started seeing some of the late summer flowers – goldenrod and milkweed primarily, but if you look closely you can always find little patches of treasure that most people walk by. I think what amuses me the most is that I can be standing knee-deep in a patch of flowers, camera on tripod pointed right at a flower, and someone will walk by and ask what I am shooting! They don’t even notice that there are wildflowers there! These two images are actually portraits of the same type of flower at different stages of its life cycle. They are both of a plant called Yellow Goatsbeard, aka Jack-Go-To-Bed-At-Noon. The yellow flower is the Goatsbeard as it initially blooms, while the puffball is the flower after it goes to seed. Both were found in the same patch mere feet from each other. 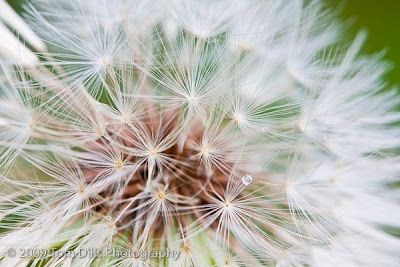 They look a little like Dandelion but much prettier.